This Spring, our farm received a grant from The FruitGuys Community Fund to help our farm expand our pollination capacity and increase our farm diversity and offerings to our local customers through three projects: 1) honey bee hive expansion, 2) native pollinator habitat strip establishment, and 3) blueberry stand establishment. You can find out more about The FruitGuys Community Fund here. We were granted funds to establish four more honey bee hives at our farm, to plant a blueberry patch and install a deer fence around it, and to buy seed to establish a 25 ft by 1700 ft pollinator strip bordering our farm fields. We plan to implement most of these projects this year but, of course, will continue to maintain them and reap benefits from them into the future. We will be increasing the number of pollinators both by introducing more hives and by providing more habitat through the pollinator strip and blueberry bushes. This will benefit our crop production and local ecosystem and our customers will get the added benefit of organically produced blueberries and local honey. More and more, we are hearing news of the loss of honey bee colonies all across the United States. We’ve had two honeybee hives here at the farm for a few years now. When I heard about this grant, I thought it would be the perfect opportunity to expand the number of our hives. This spring, when it was raining and the fields were too muddy to do field work, we built supers and frames. In April, we installed two packages of bees, and they are both going strong. 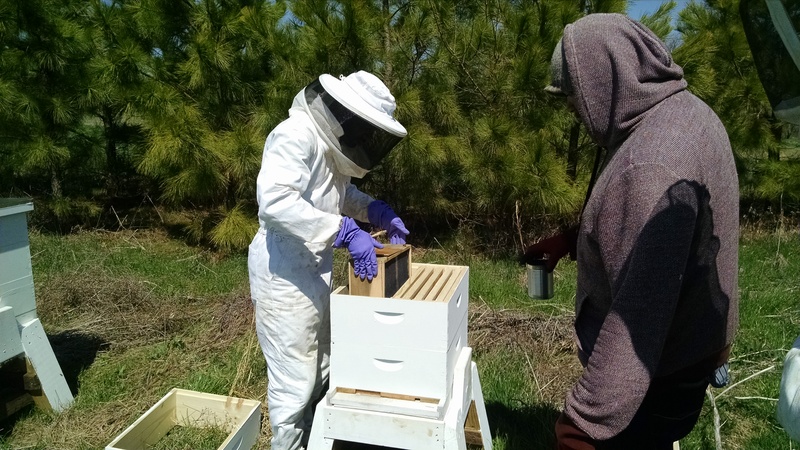 Our farm apprentices helped install the packages and help when we check in on the hives. These hives are located near the future blueberry patch. To add two more hives, I made splits from the two strong colonies already here at the farm. The splits both succeeded: they each raised their own queens which are now laying well. 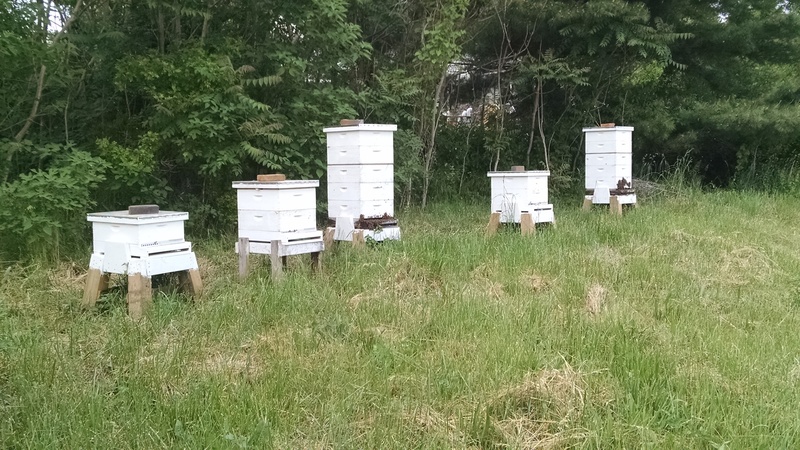 In the photo above, we have the two original hives, the two splits, and the smallest hive was a swarm from the hive to the far right (a bonus hive). Right now, we now have seven hives here at the farm. For the blueberry patch, this year we will be preparing the ground for planting next Spring. Blueberries require very acidic soil, so it will take several months for the added sulphur to be broken down by soil organisms and lower the pH. We also need to work up the soil and remove the grass and alfalfa that had been growing there for the past several years. We’ve recruited some pigs to help us with this job. They are helping to remove some of the vegetation and are adding some needed fertilizer as well. 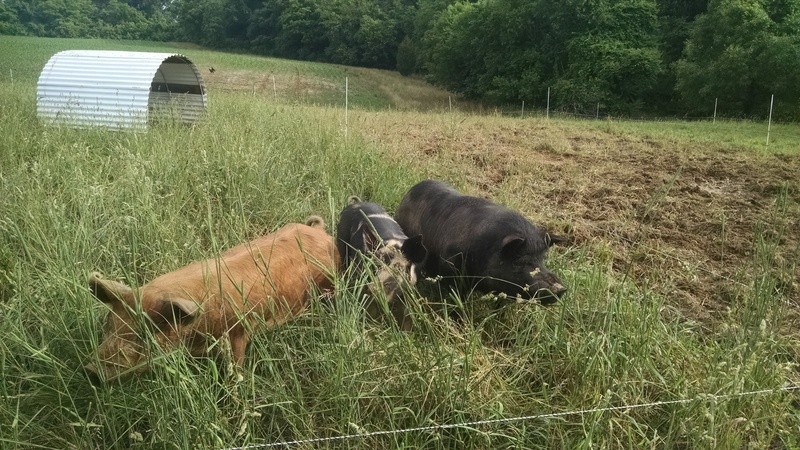 We set up the “deer” fence to keep in the pigs for now. 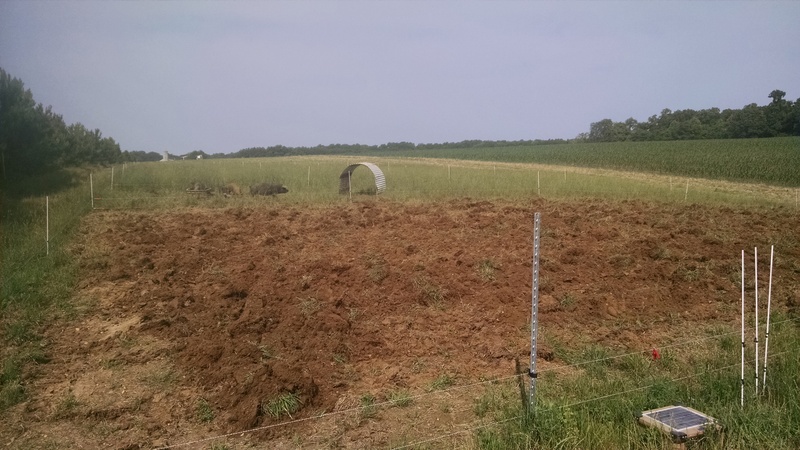 Once the blueberries are planted we will set it up to keep out the deer. We’ll also spend this summer working up the ground where the pollinator strip will be established. We will till up the existing alfalfa, grass, and weeds and work out some of the weed seeds before seeding the native pollinator mix in late summer/ early fall. Check back in again soon. We’ll keep you updated on our progress throughout the summer.